A bus driver has smashed his vehicle into traffic and pedestrians in the western Indian city of Pune, killing nine people and injuring 27 others. The driver damaged 40 vehicles before the bus was brought to a halt after 30 minutes and police arrested him. The driver, named as Santosh Maruti Mane, "went berserk" on a 25km (17 mile) rampage during the morning rush hour, police said. They are questioning the 30-year-old driver to try to determine a motive. Mr Mane, who is a driver with the government-run state transport department, arrived at a bus depot early on Wednesday and drove off with an empty bus, police said. Eyewitnesses said he drove the vehicle at very high speed and on the wrong side of the road through busy areas, running over pedestrians and smashing into vehicles. College student Sharif Ibrahim Kutty, 21, was among the two people who jumped into the moving bus and stopped the driver. He told BBC Urdu: "I was going to college on my motorbike when I heard a screeching noise and saw that a bus nearby was racing across the road at a speed of 80-90km/h. "It ran over this woman right in front of me then it crashed into a car. I was going to help the woman when I saw that the bus suddenly turned around and began speeding again. "I started chasing the bus. I was blowing my horn, yelling and waving and trying to warn everybody to get out of the way." Mr Kutty, a student at Pune college, said police fired to try to stop the bus. It then slowed down after another collision. He said: "I got off my motorcycle and crossed over and got on to the bus from the passenger door. I got hold of the driver and threw him off." Mr Kutty said the driver "did not look angry, he just seemed expressionless". Pune police chief Meeran Borwankar told reporters: "We don't know why the driver behaved like this. He just went berserk. We are trying to find out the reason. "Citizens came forward and literally threw children away from the road. He was in such a dangerous mood. Ultimately he was held [by police] but the damage has been tremendous," she said. 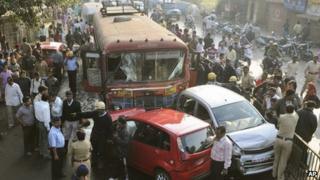 TV pictures showed smashed cars, cycles and auto-rickshaws that had been hit by the bus. "Whoever came in his way, he just rammed into them," one eyewitness told a news channel. Another witness said: "I was out jogging, there was a noise, I jumped immediately that is why I was saved. This is my second life, I would have been dead."